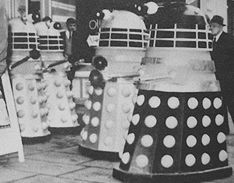 Eager to exploit his rights over the Daleks without the involvement of The Doctor or the TARDIS, Terry Nation collaborated with David Whitaker to create a Dalek adventure set on Skaro which exploited the Dalek mythology without relying upon the BBC. 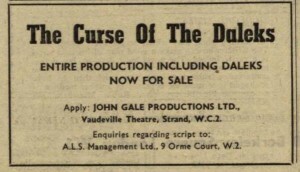 The result was a play produced by John Gale called The Curse of the Daleks which ran for two weeks at London’s Wyndham Theatre, starting on December 21st 1965.1 This was in the middle of the broadcast of the immense twelve-parter The Daleks’ Master Plan and interest in the Daleks was starting to wane as the shops filled up with cynical merchandise. For the purposes of this production a set of Daleks was needed and surviving paperwork states that five new props were built. Paperwork can occasionally be misleading or unclear so, for the avoidance of doubt, a number of features can be used to confirm these were new props. The centre-lines of their shoulders have a large ridge or seam. The fact that it is identical on each prop demonstrates that this imperfection is in the mould itself. 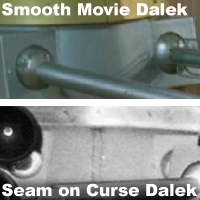 Excluding the Black Dalek, those props that survived of the eight original movie Daleks had their seam sanded down to a greater or lesser extent. Broadly speaking, the area between the gunboxes of the first batch of Movie Daleks was smooth – The Curse of the Daleks props have an un-sanded ridge. 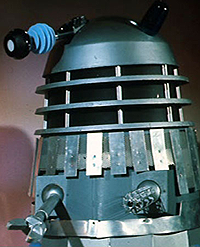 The collar screws which mount the collars to the shoulders are positioned differently to Daleks which had been built before, plus the manner in which the neck cage aligned with the shoulder section is asymmetrical – unlike the Daleks from the first movie. All this evidence confirms that the Curse props were built in late November or early December 1965. But as with every aspect of Dalek history, all is not as it seems. Taking into account the above analysis, it would at first appear contradictory to learn that fellow researcher Mark Dando reported Bill Roberts recalling that film Daleks were used in the stage play to save money. Since the play had a modest budget, this would indeed have made sense. So which version of events is wrong? As it turns out, perhaps nether. All the evidence actually agrees, once it is interpreted slightly differently. The new Daleks await action. Click for a larger view. 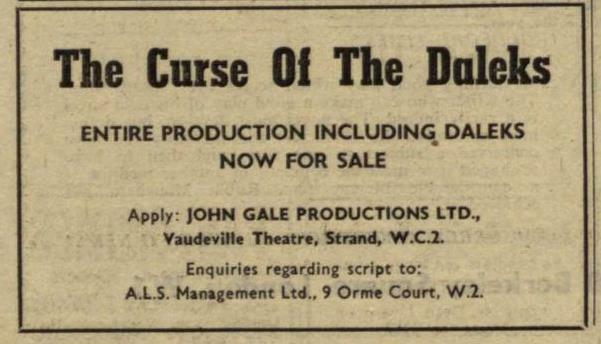 If Bill Roberts recalls dual use of stage and film props – yet it is a certainty that the Curse props were brand new – then it reveals an enterprising deal must have been struck. In the winter of 1965 AARU was preparing to make a second feature film starring Peter Cushing opposite the Daleks. Official confirmation came in the press on 16th December 1965, less than a week before the play was due to open. Milton Subotsky was looking for ways to make the film even more impressive onscreen than the first movie and had become aware of Curse of the Daleks. He quickly realised that he could utilise the production’s Daleks to boost the numbers in the movie in a very cost effective manner. He arranged to hire the five props from John Gale when the play closed in early January. This reconciles Bill Roberts’ recollections of prop-recycling with the fact that new props were made. 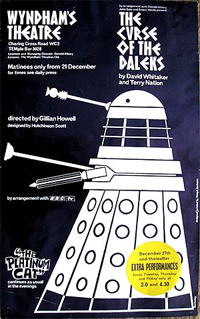 The storyline of the play was set after the original Dalek serial and therefore the style of prop was intended to exactly match the creatures as they had first appeared, rather than the solar-panelled versions which debuted in The Chase. A perhaps surprising concession towards continuity, but it would also mean quicker construction. As with all props built since February 1965, the moulds created for the first movie were employed and thus the props had flat-top gunboxes, and misaligned hemispheres. As mentioned, unlike the props from the first movie, the prominent seams which were produced in the mould for the shoulders were not sanded down and they can be seen between the gunboxes. The Curse scripts required additional Dalek attachments. One Dalek had a torch-attachment in place of the sucker, and the light was used to activate sensors to open hidden doors. The script also called for Daleks equipped with claws. Yet another important fact which provides circumstantial evidence that connects the play to the second film. 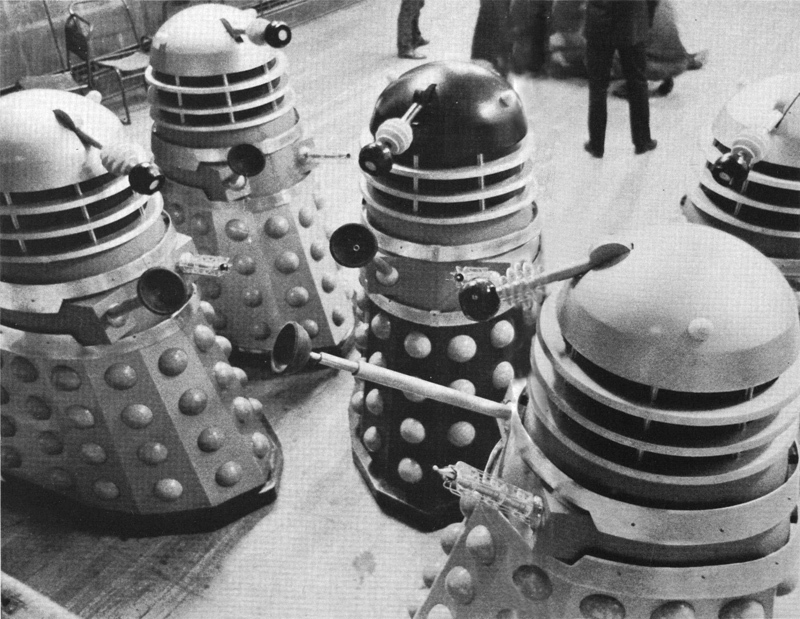 The second movie, which began shooting approximately two weeks after the play ended, showed Daleks with a miscellaneous collection of attachments which are irrelevant to the narrative of the film. The new movie Daleks had claws that had never been seen on screen before, and one Dalek is famous for having what is usually referred to as a “silver sucker” – however on closer inspection the attachment is not a rubber sucker at all, but a small, reflective cone – basically a lampshade – complete with a socket inside of the correct size to accommodate a bulb. Cooperation between the respective producers of the play and film meant that by ‘sharing’ props, the unusual attachments from the play would end up on the big screen, perplexing all those who glimpsed the so-called “silver sucker” which functioned as a Dalek-style illumination-device in its former life. Further evidence of a metamorphosis from play props into Movie Daleks could be seen when actress Jill Curzon was photographed with a Dalek as part of the publicity for her role in the second movie. In the Curzon photo a blend of two Dalek styles is revealed. The prop was fitted with slats as per the requirements for the second movie, but it carried a gun with internal spokes, as per the design of the stage play props. 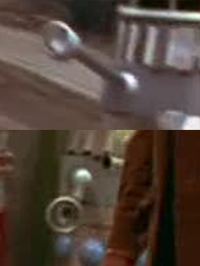 It also has an claw attachment unrelated to those in the first movie, and it has a black eye-stalk pivot as per the Black Dalek from the stage play. The eye-pivot is carelessly striped with silver paint, showing evidence of a recent hasty refurbishment into its silver livery. 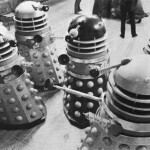 When the Movie Daleks went before the film cameras on Monday 31st January 1966, the five Daleks which had appeared on stage were all recycled – however their modifications were incomplete and their condition was deteriorating, as will been examined during The Daleks Invasion Earth: 2150AD. October 1966 – The Stage. Click for a larger view. Some sources suggest the play ran for a month, but with only matinee performances, there would have been no rationale to running the play past the start of January when children would have returned to school. Thank you to Richard Bignell for the information regarding the ill-fated plans of a tour.